Alka Seltzer Original Tablets provide fast and effective relief for headaches and upset stomachs especially after having too much food or drink. The quick action formula is designed to prevent upset stomach symptoms like belching abdominal fullness and heartburn which are quickly dissolved away by these tablets. They also tackle some of the effects of colds and flu such as fever and constant sneezing. They also help to relieve runny noses clearing sinuses and airways. These effervescent tablets provide pain relief from symptoms like sprains strains period pain muscular aches back pain sore throats lumbago rheumatic pain migraines and joint stiffness. Any lingering aches and pains are soothed and alleviated with this fast-acting medicine. These tablets contain aspirin well known for its pain relief properties. 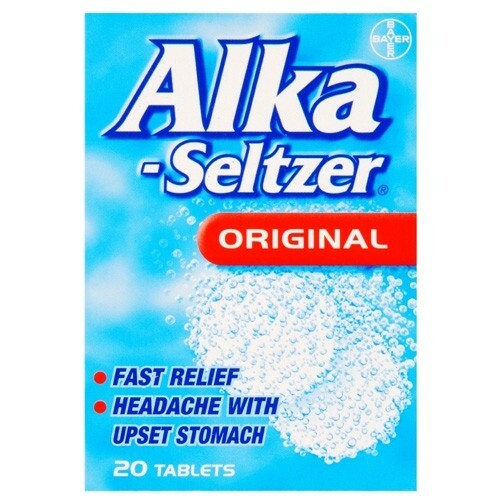 These Alka Seltzer tablets are also useful for heartburn and indigestion common effects of over-eating and drinking. They are recommended for use before bed and again first thing in the morning. Aspirin 324mg, citric acid 965mg and sodium hydrogen carbonate 1744mg. Alka-Seltzer must always Alka Seltzer must be dissolved in water before taking. Dosage: Adults and children aged 16 and over: 2 tablets every 4 hours, if necessary. Maximum dosage: Do not take more than 8 tablets in 24 hours. The dosages should not be continued for more than three days without consulting your doctor. Do not give to children aged under 16 years, unless on the advice of a doctor. If symptoms persist consult your doctor. Please read the enclosed leaflet carefully. DO NOT EXCEED THE STATED DOSE. CONTAINS ASPIRIN.